Tennis was just one of the activities that visitors to Rockside Hydro were able to enjoy in the 1920s. The hydro's grounds were extensive and the main building was some distance from the courts, which were next to Cavendish Road. The house visible through the trees on the right is Claremont, which was built by Charles Rowland, the man who built Rockside. 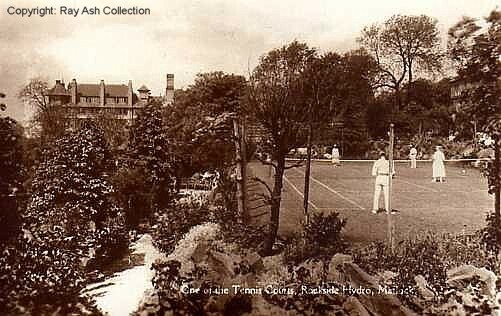 Tennis had been played at Rockside since 1880 as an advertisement for that year offered tennis as an activity; the grounds had been landscaped and croquet, lawn tennis and other games were available. Tennis became increasingly popular in the United Kingdom after 1875 when Wimbledon laid its first tennis court on a croquet lawn and Matlock Hydros would not have wanted to be left behind. In 1887 a new dry tennis court was constructed to provide recreation when the grass courts were not available. The dry tennis court continued to be offered all year round, including at Christmas time. A 1921 advertisement described the court as "gravel". The "beautiful" grounds were often mentioned in advertisements. Henry Ballington, a local landscape gardener who lived nearby, designed the gardens although it is unclear if he did so after the 1903-6 extensions or after those of 1925. "One of the Tennis Courts, Rockside Hydro, Matlock". Published by Kingway Real Photo Series (no address). Unposted. "Derbyshire Times and Chesterfield Herald", 6 November 1880. "The famous Hydropathic and Boarding Establishment, Rock Side, Matlock Bank, has come under new management". See History of Tennis (this is an external link and will open in a new window or tab). "Derbyshire Times and Chesterfield Herald", 31 December 1887. "Derbyshire Courier", 4 January 1910. "There are both croquet and dry tennis lawns, and also bowling and putting greens". "Derby Daily Telegraph", 20 October 1921. "Derby Daily Telegraph", 30 December 1932. One of the announcements of his death. Henry Ballington can be found on Wellfield Road in the 1901 census. He advertised in Kellys Directory 1908 | Kellys Directory 1912 | Kellys Directory 1916.